You can maintain a hands-on approach to your child’s education with JumpStart Academy Kindergarten! You can now keep track of your kid’s development through in-game progress reports. Does your child need to focus more on counting, but they have their shapes memorized? Do they know where their eyes, ears, mouth, and nose are, but hesitate when it comes to their sight words? With our easy-access progress reports, you won’t be left in the dark! You can access your child’s progress report over in the Parent Center. Here, you can monitor each player’s advancement through certain topics. For example, in the “Reading” section, you can see if they are is struggling with tracing certain letters, or if they are flying through word building. Under the “Math” section, you can track their growth through learning basic arithmetic and shape recognition. 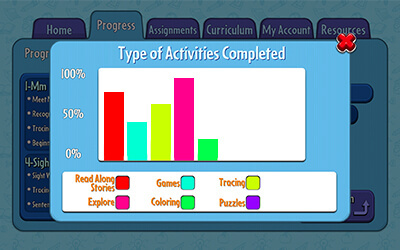 If you click on the “Progression Tracker” button, you can access a bar graph that will allow you to compare the types of activities your child has completed. 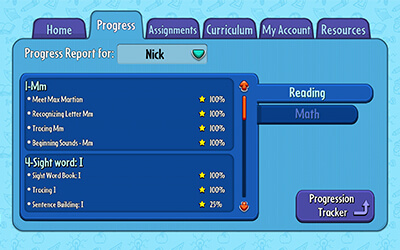 As your child journeys through the game, parents can track their academic progress through these progress reports. They will keep you updated on their performance in each game. This will allow you to monitor how they are doing on their lessons and figure out which concepts they understand and which ones they need to focus on. JumpStart Academy Kindergarten’s up-to-date progress reports will allow you to play an active role in your kid’s education and keep them on the right track!